Windham's Barn01263 715779work01603 870304fax Self-cateringThis luxurious, spacious barn conversion set in the heart of rolling countryside is a wonderful spot for a relaxed holiday for families or friends wanting to enjoy the rural life, wildlife and peaceful surroundings. There is a tennis court, a sunny garden with open views, and the North Norfolk coast is just a short drive away. Other: Towels, Books and Games. Radio. Clock radio. Travel cot, High chair, Stairgates. Welcome Hamper. Windham's Barn offers weekly bookings starting on Friday. This luxurious, spacious barn conversion set in the heart of rolling countryside is a wonderful spot for a relaxed holiday for families or friends wanting to enjoy the rural life, wildlife and peaceful surroundings. 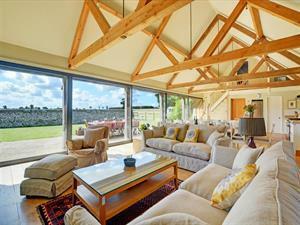 There is a tennis court, a sunny garden with open views, and the North Norfolk coast is just a short drive away.